I kicked off the morning in the kitchen with some plain (for Chris) and cherry-filled pancakes. 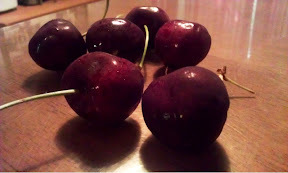 I've made blueberry and strawberry pancakes in the past, but I don't usually have cherries on hand. Pancakes are definitely tasty with cherries too! I took a short break to do some research on a few recipes and then it was back into the kitchen. 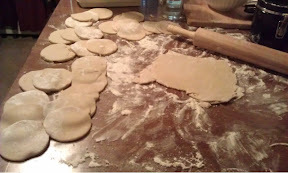 I was determined to make pierogies, if nothing else today. The dough recipe yielded far more than I thought. I'm not entirely sure how many equal a "serving size" for pierogies (my guess is three to four), but it certainly isn't one or two, which is what I was I initially thinking. So next time I'm certainly scaling the recipe back (five cups of flour should have been a tip but I wasn't really processing that fact - I was too busy enjoying viewing recipes on the webOS tablet). 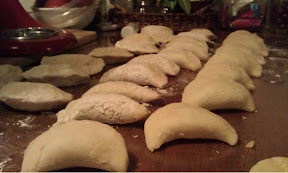 So i ended up with a fair number of cheese and potato pierogies that are now living in my freezer. With the pierogies boiling in water and converting the kitchen into a steam room, I decided it would be a fantastic idea to make cookies. I think the heat was affecting my judgement. Mix the dry ingredients (sugar, baking soda, powder, nutmeg, flour) together. Add sour cream, eggs, vanilla extract, and lard, mixing well. Take dough and roll out on floured surfaced. Use cookie cutters to cut shapes. *note: the less flour added to the cookie dough during the rolling process, the less dry and more soft/chewy the cookie is. Bake 7-10 minutes. Allow to cool before decorating. Makes approx 3 dozen. I didn't have any sour cream (I'd used it all for the pierogi dough) so I used a tip my mom had given in the recipe above and used milk and added two teaspoons of lemon juice. 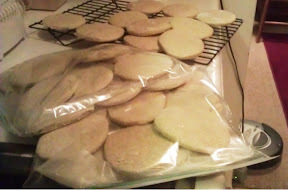 I did use far too much flour while making these, so they're a little dry. But they taste pretty close to what they should and every bite is a like a bit of my childhood. I jammed a few dozen into the freezer because there's no way the two of us are going to eat that many cookies anytime soon.